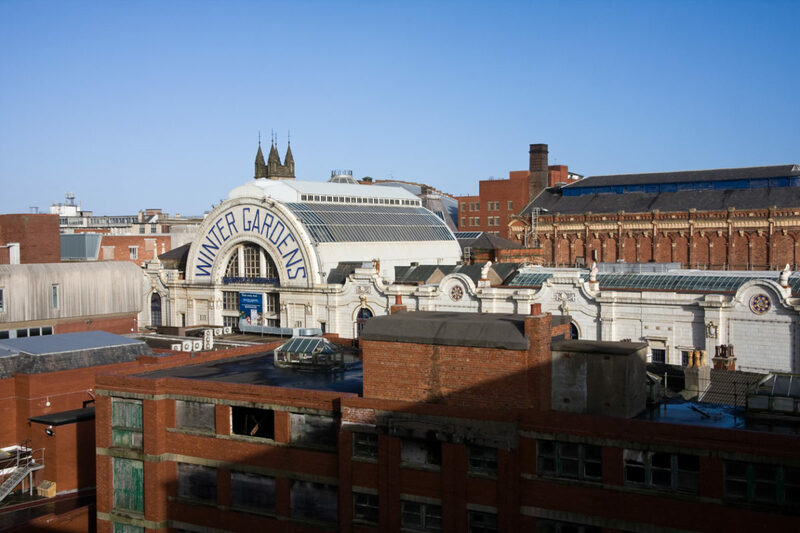 The Winter Gardens is home to Europe’s second largest theatre (the Opera House) and is one of Blackpool’s most treasured historical buildings. It opened in 1878 and has seen the likes of Frank Sinatra, Shirley Bassey and a host of West End theatre productions over the years. I’ve been to several gigs (including The Arctic Monkeys and The Subways) there and I also had the fantastic job of photographing NALGAO’s three-day conference throughout the venue back in October 2008. Although the interior decor needs sprucing up and looking after, I personally think that it’s still one of the town’s better assets. I took this photograph from the top level of the recently regenerated Hounds Hill Shopping Centre car park. I’d always struggled to get the shot I wanted of the exterior of the Winter Gardens because there simply wasn’t a high enough vantage point to produce something more interesting from the usual images you see of the building. The new car park at the Hounds Hill helped me to overcome this problem and, at the same time, offered the chance to see Blackpool’s town centre from a completely new perspective. I’ve recently re-edited my series of photographs for the Blackpool project to include some new photographs and (hopefully) make it a stronger set of images. This can be seen by visiting the Blackpool: An Unimagined Space? gallery. This entry was posted in Blackpool and tagged Architecture, Art Deco, Blackpool, Cityscape, Winter Gardens.